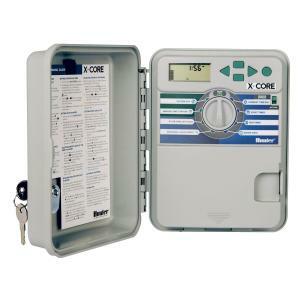 The X-Core fixed station controller by Hunter is available with four, six or eight easy to configure stations and is compatible with Hunter's Solar Sync (smart) technology which regulates irrigation runtimes based on locally measured weather. This is a great entry level residential controller with three programs and four start times per program with a maximum station run time of four hours. Converting to a weather smart controller is easy, just plug in the Solar Sync ET sensor (sold separately). The X-Core is also compatible with Hunter ROAM remotes for easy programming up to 1000' away. Automatic short circuit protection feature avoids total system shutdown by detecting electrical faults and shutting down affected station only.